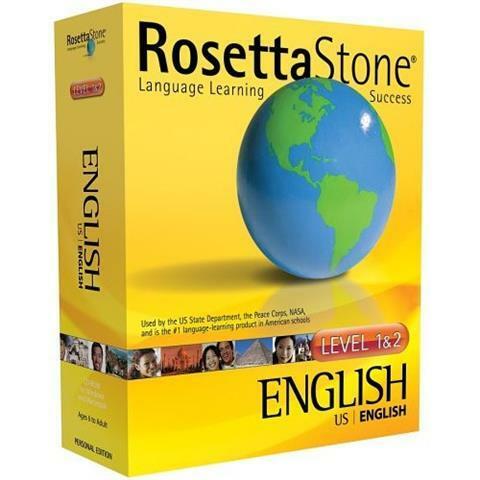 Rosetta Stone is the name of proprietary piece of software for language learning. The name comes from the Rosetta Stone, a large carved stone from Ancient Egypt‏‎ with a single text in 3 languages which was used as an aid to translation. The principle of the Rosetta Stone software is the Audio-Lingual Method, that is using set phrases over and over again until they are drilled into the brain. In the early lessons learners see pictures of items and hear them said in the target language‏‎. They’re then given a multiple choice selection of 4 items and have to choose the item they hear said. This basic principle is used throughout the program into the higher levels with the vocabulary‏‎ and grammar‏‎ becoming more complex. However, the method is perhaps best suited for lower levels as there is little or no exploration of grammar or syntax‏‎, little speaking‏‎. Furthermore, the product has been criticized not only for this linguistic aspect but also the cultural bias: the pictures used are almost exclusively American (and taken in the Washington DC area) and do not apply to many other cultures. The software is useful for individual learning only and not in groups. Trying out Rosetta Stone – Pete West’s blog article on what it was like learning with Rosetta Stone.